British actor best known for playing Thorin Oakenshield in the Hobbit trilogy and for films such as Into the Storm and TV series Spooks and Robin Hood. Why would they want a six-foot-two actor to play a dwarf? Also, we spent most of the shoot much bigger than a 6-foot-2 guy. I mean, I had lifts in my shoes, I was wider, I was taller, and bigger-haired. Armitage could be best to played the next Wolverine. Perfect listing, definitely 6'2.5"! He was my main choice for Batman before Ben Affleck was cast. At 6ft2.5, I can't see Richard ever being cast as a hobbit! That's exactly what he can have from me. He has a very good posture. Why have a tall man play a dwarf? It's simple dwarves (and giants) are ugly. The most common kind of dwarf is Achondroplasia. Peter Dinklage from "Games of Thrones" has this. Most Giants like "Andre The Giant" have Acromegaly. Normal people are seen by normal people as attractive. Those with genetic of environmental diseases are seen as ugly. So if you want to have a handsome heroic dwarf it is better to start with a normal person and make them appear tiny through movie magic. Armitage is a hell of an actor. I always thought he should be the next James Bond. Still do. The best height for a leading man in films is in the range of 6'2" to 6'4". Hi Rob, I just came across this photo of Armitage and Prince William, who's listed as roughly the same height with Armitage. You could easily do an image search of these two guys online. Prince William seems significantly taller than Armitage and you could see that from the way Armitage is looking up at him. He had even commented that he was impressed by William's height. I'd say at times Richard does look just 6ft 2 flat, he may well be 6ft 2.5 more like before mid-day. But that photo in the new zealand paper isn't really helpful, you can see the full photo here. He's losing 5 inches in height there. I wonder how many times Richard has encountered 'Armitage' jokes in his lifetime? Rather him than me! Richard can have a very impressive 6ft2.5! Lee Pace could look 1.5" taller than Armitage than just 1.25". Agreed. It would be his low. This mark is still fine for him aswell. Rob, how about a switch to 6ft2¼? He can actually look 6'3" with 6'0" Luke Evans. Well, he certainly does have a big head the more I look at him. Rob, I wouldn't go lower than 188 cm though. Rob, who do you think would measure taller, Justin Hartley or Richard Armitage? Editor Rob: tough one to say...at times I think Armitage doesn't seem over 6ft 2, but it can because he has a big head I feel. I would say Armitage would measure slightly taller than Peak Hugh Jackman. no more than a cm taller. He's not towered by Lee Pace who would be a full 6'4". Seen him with Andrew Lincoln, Rob? He looks more 6'2 flat here: Click Here, not impossible he measures a little over it though. I keep feel like that armitage look almost identical to a peak hugh jackman with the same buff look/shapes and height. Rob, how would Richard Armitage compare to Michael Phelps, Brandon Routh, and Charleston Heston? Editor Rob: at times, I think he only looks a 6ft 2 guy, but then, he does have a decent sized head, which makes him not stand out as a big 6ft 2 and change guy. This guy needs to be James Bond! I think 6'2.6" would be fine, but he only looks an inch shorter than Lee Pace who I believe is a legit 6'4". @Alex Don't worry dude. I knew it was a joke. :P.
In all seriousness, Armitage could be 6'2.75". His comment about 'why would they want a six foot two actor to play a dwarf' is hilarious! Still I read he is in the running for James Bond and he does have the look for it. Rob, what would be Armitage's morning height range? Johno REALLY LOL?! Dude. That was special effects. Where in the world did you even think about 4'11"? We should downgrade poor Ian Mckellen to 3'10" and Martin Freeman to 3'6" and Benedict Cumbatch to 3'11"
Saw him in the Hobbit ------ 4'11 at best. Armitage I think generally looks in that 6ft2-2½ zone and occasionally near 6ft3. Lowest I'd give him is 6ft2¼ which could be on the money since it's between his two claims. Bond producers seriously need to give this guy a call. Rampage I do believe Lee Pace as a 6'4" and would definitely measure over 6'4" in the morning. Armitage should be the next James Bond. Looks 1-2in below Pace who could be a full 6ft4. Honest 6'2.5" He holds well with Lee Pace who towers almost everyone! @Rampage He will definitely edge out Ryan. Armitage is a true 6'2.5", Reynolds isn't. He could be 75 inches when he wakes up. I think the height is correct. He's a legit 6'2, but I think his listed weight is off. There is something wrong with his weight being listed in the 160's. At his height, he would be a total bean pole. He's got a nice athletic build and while he may be thin, It would just seem he couldn't weigh in at the purported weight. Think.. most freshman college QB's are his height, but weigh around 180-190 range and they are super skinny before they start maturing and packing on the pounds. The 6'2 height is correct, but the weight is definitely off. Rob, do you think this guy would edge out Ryan Reynolds? This height is correct. He's tall, beautiful, and looks like Hugh Jackman's twin! I'm not an expert when it comes to guessing men's weights, but 165 lbs. seems low. I know he's naturally very slim, but with his height and the amount of muscle he has (mostly upper body) I would've guessed he weighs no less than 180-185 lbs. Looks really skinny and tall recently on Hannibal, don't know he looks as lean as he does, I know Tom Noonan and Ralph Fiennes beefed up for the part of Francis Dollarhyde (I think Armitage had limited prep time), but an interesting interpretation. My interest in the show varies, I respect their artistry but some of their changes are more confounding than entertaining, their Hannibal too superhuman. My dreamy boy Mr.Armitage is a handsome smart boy and I really love him.m from bangladesh but I really like this tall boy.i wish I could meet him and see him once.i wanna be somethin to him.i also like his way of act.when I see him in tv,i imagine myself with him :) I m crazy loving him. "Richard Armitage's height is 6ft 2¼in (189cm)"
Rob, is it possible for him o be somewhere between his two claims? When they finally let him play to his full height, he's my candidate for the next Bond. There is something to be said for 6'2" being the optimum height for a male movie star. Look at those heels.Why aren't his pants coming down the leg. Agreed, Armitage is no less than flat 6'2", maybe a shade over even. Also agreed on Daniel Craig. Since when is 5'10" 'short'. He's no giant and he is much shorter than the other Bonds, but he looks totally average height unless he's with some goon. Great Bond too. Looks a solid 6'2" to me - he stacked up quite tall in the "Divine Proportion" episode of one of the Lynley episodes against equally tall Nathaniel Parker. And he is a dish. Surprised he wasn't considered for Bond although I admire what Craig's done with it (comment below about Craig being a "dwarf" notwithstanding - and I've seen Craig in person buying groceries here in New Mexico, and while not tall, he's hardly unusually short). By the way, very few people bother about differing the morning and evening measurements. And not many people know about difference in those measurings. So, maybe, once Richard measured himself in the morning and got 6'2.5". Later he measured again and got 6'2". He might consider his first measuring as not very precise. So he started to claim 6'2". But the real matter was in the different times of day, when Richard measured. Rob prefers to list evening height, because he lists himself with his evening height. :) And for the evening Richard's height 6'2" fits better. Claiming 6'2, and looks around that mark, maybe even less at times. I think 6'1.75 - 6'2 zone. Doesn't look quite 6'2.5 with Martin Freeman, Ian McKellen and Elijah Wood in premiere-pics, maybe closer to 6'2 flat. He's bending his head in a few of the shot's I've seen, which makes him appear a little over 6'1. When standing straigt though, 6'2, maybe 6'2.25 is possible. Surely he's not 6'3. I spotted him first in 'The Hobbit'. But then I saw him in this terrific new British TV series 'Strike Back Origins". Would it be impolite to suggest that he a Daniel Craig swap roles? Craig actually is a dwarf isn't he? Actually looks 6'4" in the Handsome Stranger episode of the Vicar of Dibley, but I think they altered the angles to make him look even taller. Doesn't look under 189cm, could pass for 6'3". @Jayma lol you're dead right, I heard that too. Does he know how tall he is? There is actually a benefit to taller actors being cast as dwarves, as in also 6'2" John Rhys Davis who played gimli. The reason being dwarves despite being short as still supposed to be taller than hobbits. 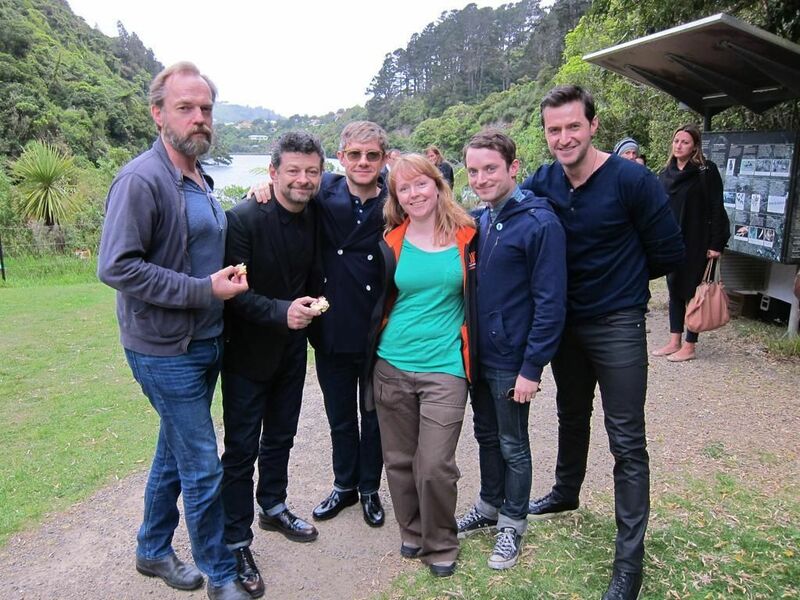 You will notice most of the hobbit actors are actually short in real life. The dwarfs and hobbits actors are shot on the same scale to make them look much smaller than the other humans in the scenes. Yes, Mr Armitage does seem unsure of his own height, which he's mentioned many times in his Hobbit interviews. The one I've heard most is 6'2.5, but he did sneak a 6'3 mention into another interview. Maybe he got tired of mentioning the half and decided to round himself up! Actually, I've read an interview where he states that he's been 6'4" since he was 14 years old. Phwooooar!!! Richard Armitage is HOT! Can't wait for him to come to NZ to film the Hobbit. Being tall myself I am thrilled to hear that he is 6'2". If he was as short as some of the other leading men on here I would be extremely disappointed!! If Richard is 6'2", how tall does that make British actor Andrew Lincoln (of AMC's Walking Dead) in this picture? BTW, how about adding Andrew Lincoln? He looks taller than 6'2". He seems to tower over most everyone in all his productions. Either he's taller or a lot of other actors are shorter than they lead the public to believe. And yes, he's a great actor and easy on the eyes as well.